For flat materials, I have long been using CorelDraw. I began with it back in 1994, and have been loving it ever since. Recently I have been trying to use Inkscape more and more. However, as many of you know, Inkscape has some dimensional issues when working with laser cutters. Typically, laser cutters use Corel as their go to application for import and cutting. Inkscape files imported in Corel are out of size. So, in one small escape from totally open source, I have used CorelDraw for my acrylic files. Top portion is to be cut with 5mm acrylic. 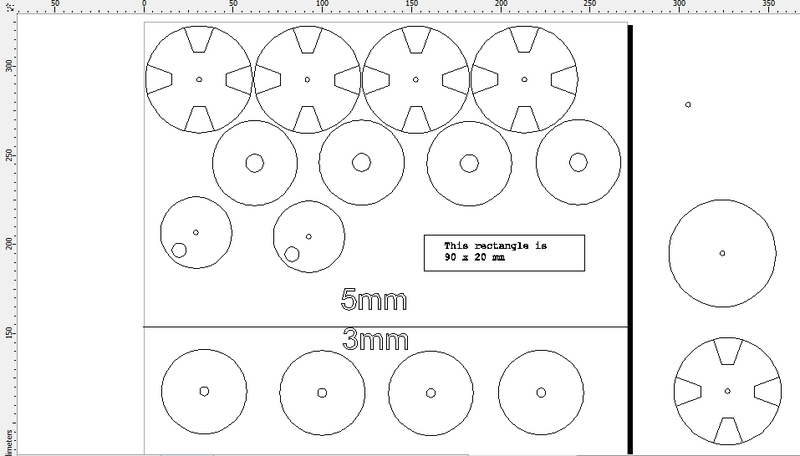 Bottom 4 disks with 3mm. On the right side we have some spare parts. Top row is the star disks which press fit to the top of the shaft, and the 50mm PVC cap press fits onto. Two per spindle. Second row is the bearing seats. Two per spindle. Third row we have the magnet disk (one per spindle). It press fits to the shaft, and a magnet is press fit and glued into the larger hole. I have since made disks with multiple holes for various magnets (experimenting), but have not included them on the official release yet. I am having better success with smaller magnets. To the right of the magnet disks is a reference mark I always include in my files. It is a rectangular box of a known size, with text indicating as such. IT is VERY helpful to troubleshoot import issues when taking to a laser cutting shop. On the 3mm side we have four bearing seat plates. These sit under or over the 5mm bearing seats. They serve to keep the bearings, and thus the shaft centered along its axis inside the spindle.